As April’s “showers” come to an end, it’s time to be thinking about the sunny days ahead. The light is up until 9 pm and there’s no longer that chilly breeze that sweeps by under a cloud or in the shade. This is the chef’s time to shine!! With all the back yard barbecues, neighborhood get togethers and kid’s sleepovers it is imperative that you have a place for everyone to gather… and still be outside. 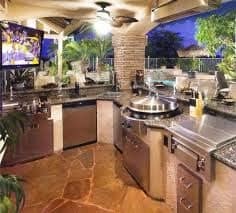 The outdoor kitchen is still an up-and-coming style because some think of it as a luxury; and of course you can get as fancy as you want with the design and equipment. But it doesn’t have to seem out of reach. It is a convenience and a necessary addition for many that can still be affordable. At Rendon we pride ourselves on knowing what is best for our clients and making sure that you get what you want. 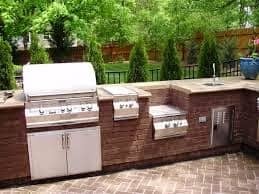 There are so many styles and choices to make when designing an outdoor kitchen; and we will walk you through picking out every piece to this amazing puzzle. 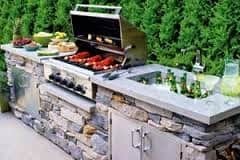 Some outdoor kitchens are a long countertop surrounding a grill with cabinets, a smoker, a mini fridge and some other somewhat simple additions. These kinds of models can be put anywhere and made with wood, stone, bricks etc. They allow you to be open and still in the middle of the party while grilling and preparing. Adding an arbor above where you can hang things is also a very nice touch. There are so many great things you can do with this type of design! 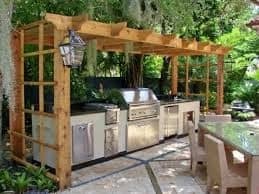 Other outdoor kitchens are more involved and really make a space of their own. With a canopy roof over head and a counter that extends into an L shape (or farther if you prefer), this is an extravagant look with endless possibilities. You can use a larger grill and even more hot plates with the extra counter space. You can also put a bar on one side with some stools for your guests. 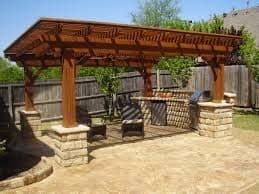 With the ceiling and big support beams give it a gazebo type of look. 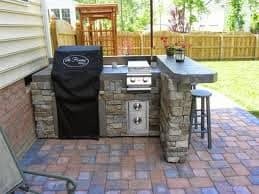 This outdoor kitchen more elaborate in it’s placement and yet still modest with the furnishings. This style is more of a literal kitchen that has been placed outdoors, providing even more than some indoor kitchens. This design offers something in between and can always have adjustments to materials to cut costs. 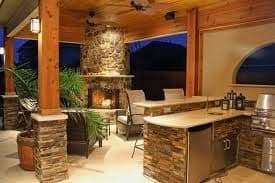 No matter what look and feel you’re going for, or what your budget is, Rendon Remodeling LLC can help you discover the potential for your backyard. Together we will create a summertime masterpiece that will liven up your grilling experience. This luxury is quite practical and will make all the difference in the way you live both with just the family and with large groups of people. So use this great idea to enhance your summer living today, call us for a consultation!